NES Adventures of Lolo 2 (USA) "Pro Levels" in 02:03.18 by Baxter & Alyosha. 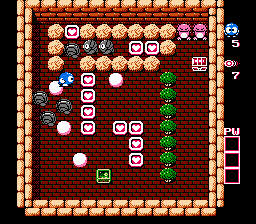 Adventures of Lolo 2 contains four so called PRO levels that can only be accessed by inputting a level password. This movie plays those four levels quite fast, and over a second faster than the last movie through a new route in Pro B. We also have a full run of this game, and some for Lolo 1 and Lolo 3.